Within each of these four segments, several new applications are emerging. For example, in the infotainment segment, navigation systems are popular with new cars. In the driver assistance segment, lane departure warning systems are assisting with driver safety. Several of these applications originated from the consumer market and are now used in automotive applications. As automotive digital electrical systems and onboard networks increase, so does the amount of semiconductor content required for designing these electronic systems. 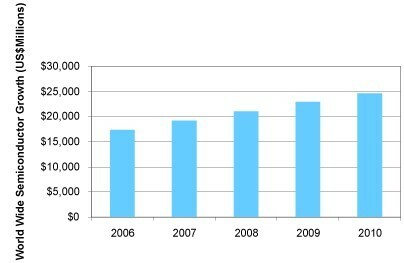 This trend is expected to continue, as semiconductor content is projected to grow rapidly during the next 5 to 10 years. While the vehicle growth is projected to be flat, the semiconductor growth is projected to grow 9 percent compound annual growth rate (CAGR) over the next five years (see Figure 2). This phenomenal semiconductor growth is fueled by increasing multimedia-rich, in-cabin applications and safety applications such as lane departure warning systems. Historically, ASICs and ASSPs were the semiconductor option of choice because of their cost-effective silicon solution. However, key market factors can result in the end of the ASIC-dominated era in automotive silicon use. These factors include: The rising cost of ASIC development, the increased demand for digital-intensive features, and the precipitous drop in the price of a CMOS logic gate due to smaller semiconductor technologies. Manufacturers are looking for a powerful yet cost-effective design platform to meet both the content and networking needs of their increasingly complex digital systems. Programmable logic devices (PLDs) offer a powerful, viable alternative to ASICs and ASSPs because they significantly reduce engineering development time and the cost of multiple silicon iterations. Unlike ASICs that need re-spins as designs change, PLDs can be programmed and reprogrammed as needed during the design process. They can be upgraded in the field if requirements change even after the devices are implemented in the vehicle. Without the up-front, non-recurring engineering (NRE) costs and minimum order quantities associated with ASICs, PLDs are a cost-effective choice for system design. Over the past three to four years, PLDs have grown tremendously in the automotive space. PLD growth is expected to continue to rise at 40-50 percent CAGR over the next five years. The evolution of automotive designs has moved toward the “platform” concept where car model differentiation is provided with one basic design. The convergence of audio, video, and data in the automotive space is further fueling the platform concept. Today, a typical automotive design cycle is approximately 24 to 36 months, which is much faster than the 60-month life cycle from five years ago. Short design cycle times place tremendous pressure on system suppliers to quickly prototype and demonstrate their designs to OEMs. Expect this trend to shorter development cycles to continue. PLDs are well known for their faster time-to-market while still meeting the quality, cost, and technical performance requirements of the OEMs. Digital content such as navigation systems, rear seat entertainment systems, and driver assistance applications have increased and are now considered mainstream products. The fear of product obsolescence from ASIC and ASSP suppliers is driving the use of PLDs in automotive electronic designs. These factors require automotive designers to have a design solution that not only offers superior flexibility, but also meets performance requirements within their cost targets. PLDs, with their low cost structure and abundant device resources, provide such a solution. As automotive digital content and control systems move to high definition, wireless communication, and multi-gigabit bandwidths, automakers and system OEMs will continue to demand top-notch quality semiconductor devices. Altera’s quality record and service to over 13,000 customers worldwide over a 20+ year history demonstrates that we are committed to supporting the highest quality and reliability customer requirements. Altera's automotive-grade products are TS16949 compliant and are tested to AEC-Q100 requirements.